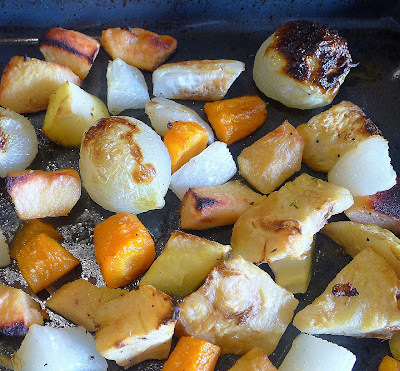 Roasted root vegetables.are easy, tasty, but pretty mundane. But, sneak in an imposter—chunks of fruity quince—and this popular side dish sings a different tune. Quince, an autumn fruit, joins up with a pan of root vegetables. 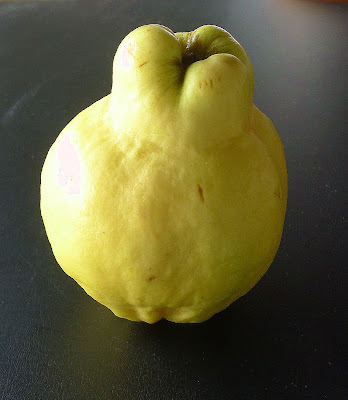 Quince (membrillo) is an autumn fruit. It looks like an oversized knobbly yellow-green apple, with a spicy fragrance and a slightly grainy texture. It is rock-hard, even when ripe, and must be cooked to be edible. It has an abundance of pectin, which allows the fruit when cooked with sugar to set up as a solid jelly or paste..
Peeling and coring quince is tough work. But if you first cook it for 15 minutes, it becomes easy to peel and cut into cubes. What vegetables to use? Carrots (zanahorias), turnips (nabos), parsnips (chirivías), rutabaga (colinabo), sweet potatoes (batatas, boniatos), celeriac (apio-nabo), small onions (cebollas franceses), beets (remolachas), potatoes (purple potatoes are pretty), and, while not a root vegetable, pumpkin or other winter squash. Combine them in any quantity you like. I seasoned the vegetables and quince with salt, pepper and fresh thyme. 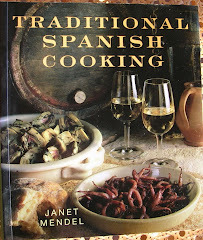 Other possibilities are rosemary, sage, bay leaf, garlic and/or spices such as pimentón (sweet or hot, smoked or unsmoked); allspice, ginger, nutmeg, caraway, cumin or fennel seeds. Vegetables can roast along with chicken or meat. 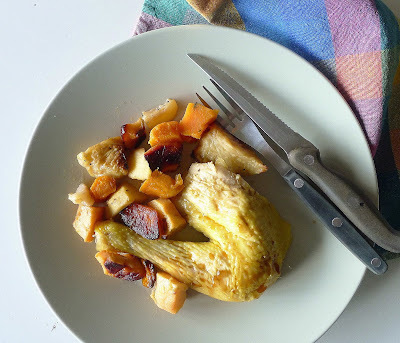 There's an imposter with the root veggies--chunks of fruity quince. Exposed! Cooked quince is slightly pink in color. Spread vegetables in a single layer to roast. My vegetable mélange included, besides quince, 3 large carrots, 1 large parsnip, 1 turnip, ½ celeriac (celery root) and 6 French onions, weighing about 3 ½ pounds in total. Cut the quince in half. 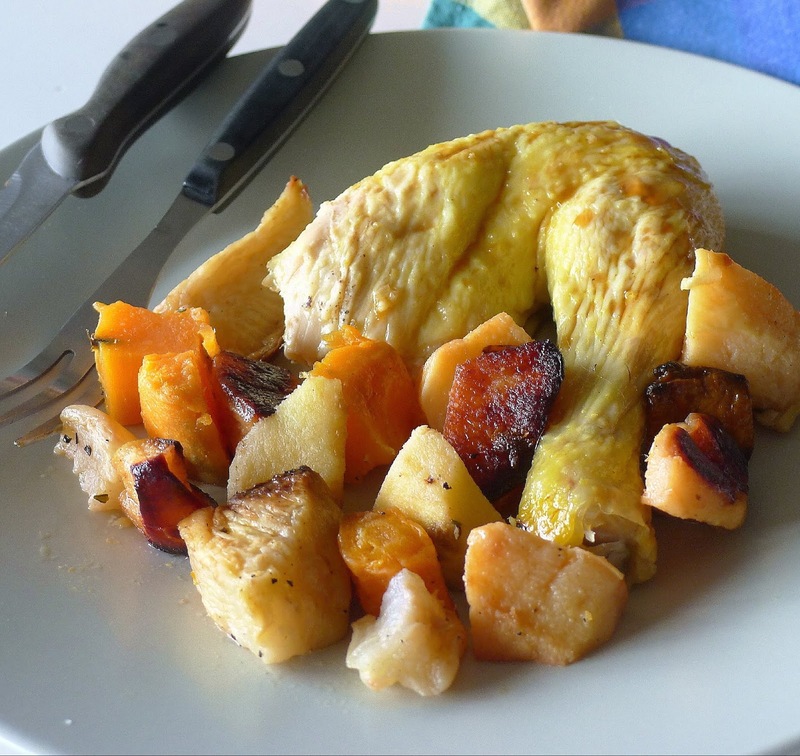 Peel and cut carrots, turnips, parsnips, potatoes, etc., in approximate 1 ½-inch pieces. Peel the onions and cut a notch in root end. Bring a large pot of water to a boil. Cook quince in the water for 15 minutes. Skim out the two halves and drain. Cook all the remaining vegetables, two or three at a time, in boiling water for just 5 minutes. Lift them out with a skimmer or slotted spoon and drain well. When quince is cool enough to handle, peel it and cut out core and seeds. Cut the quince into pieces about the size of the vegetables. Combine all the vegetables and quince in a large bowl. Add the oil, 1 teaspoon salt and pepper. Spread the vegetables on an oven tray or sheet pan. Scatter herb or spice over vegetables. Preheat oven to 400ºF. Place the tray of vegetables on the top rack of the oven. Roast them, turning occasionally, until they begin to show brown spots, about 45 minutes (longer if roasting at lower oven temperature). Sprinkle with lemon juice and keep the vegetables hot until serving. Quince Jelly; Braised Lamb with Quince. Quince and Ginger Olive Oil Cake. Out my kitchen window. In spite of the break in the clouds, the rain is bucketing down. 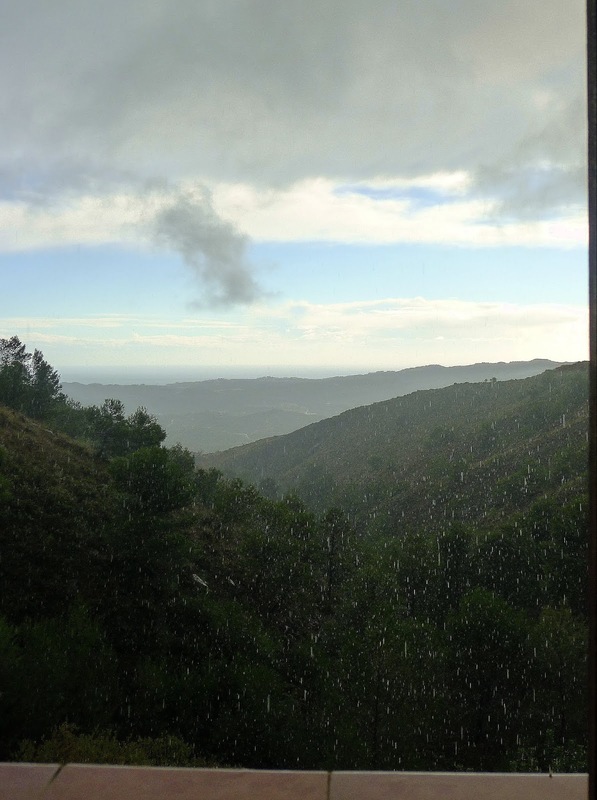 Clouds blow across the sky, alternately obscuring the view down the valley to the sea. A chill rain begins to fall. I rummage around looking for some long-sleeved tops and socks and end up pulling out the bags of winter clothes and coats and doing the seasonal closet changeover. It’s also the season when I no longer enjoy that evening copa of chilled rosado (rosé wine). Time to switch to warming reds. And, after a summer-long hiatus on oven use, it’s oh-so-nice to have the warmth of an oven-braised dish. My seasonal changeovers inspired the dish—oven-braised beef cheeks in red wine. Served, of course, with red wine, while wearing socks and a cozy sweatshirt. 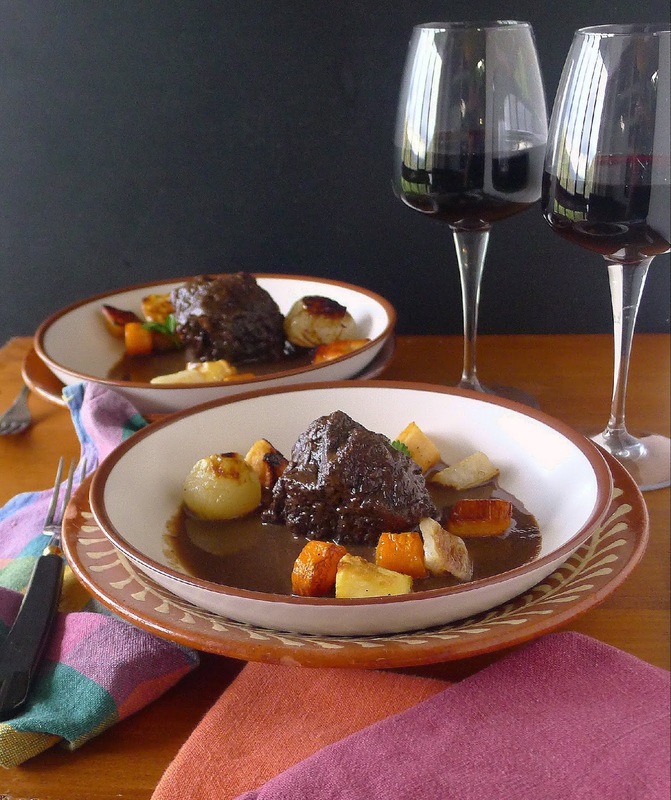 Oven-braised beef cheeks with red wine. Serve beef cheeks with pan-roasted vegetables. Or, cut up the meat and serve it with mashed potatoes to soak up that luscious red wine gravy. Beef cheeks need long, slow cooking, about two hours, to tenderize them. (A pressure cooker or Instant Pot would shorten cooking time.) 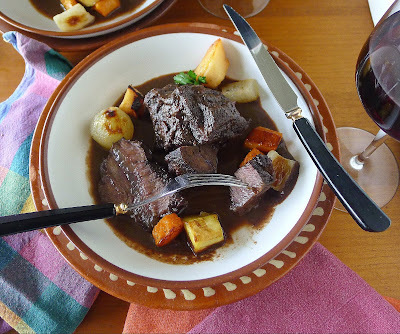 During that time, the meat shrinks considerably and the wine cooks down a lot, concentrating the flavors. Caramelized onion turns the sauce dark, velvety brown. Once meat is tender, remove it. Puree the remaining liquid with carrots and onion. Sieve the sauce. It probably needs no thickening. Use any dry red wine that is good enough to drink. I used a crianza from La Rioja. (Crianza wines have a little time on oak.) A bottle of wine equals 750 ml./ 25.5 fluid ounces or about 3 ½ cups. The wine should almost cover the meat. Add additional water if needed. 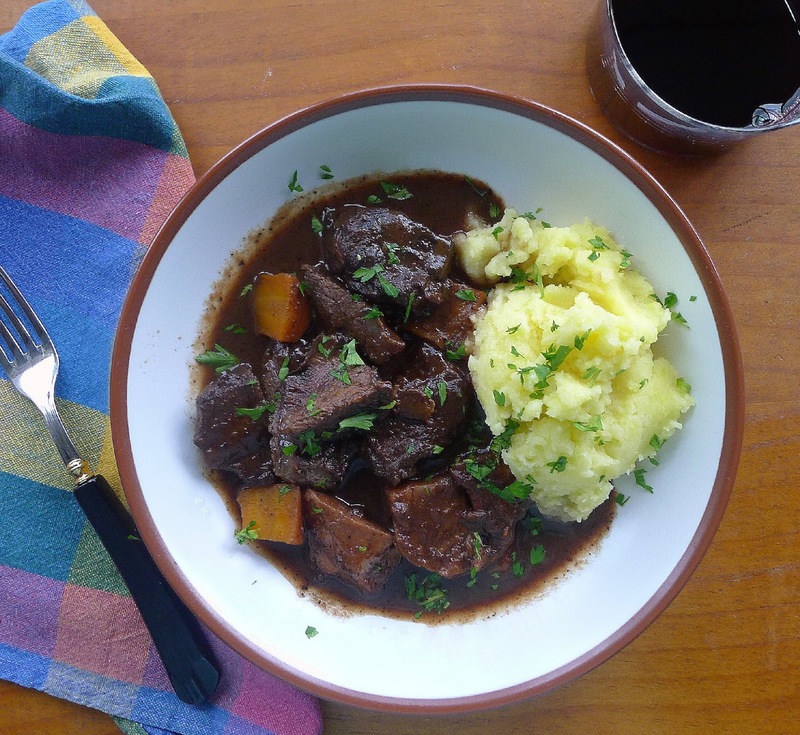 Braised meat is even better the day after it’s cooked, so this is a fine make-ahead dish. 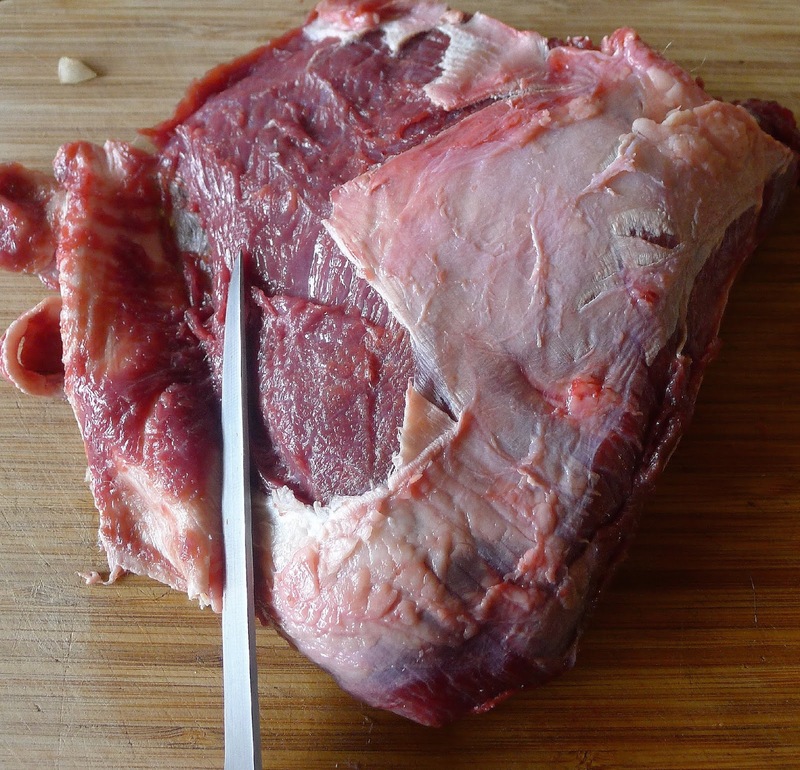 Use the tip of a knife to remove the thin membrane that covers each piece of meat. Cut each one into two or three pieces. 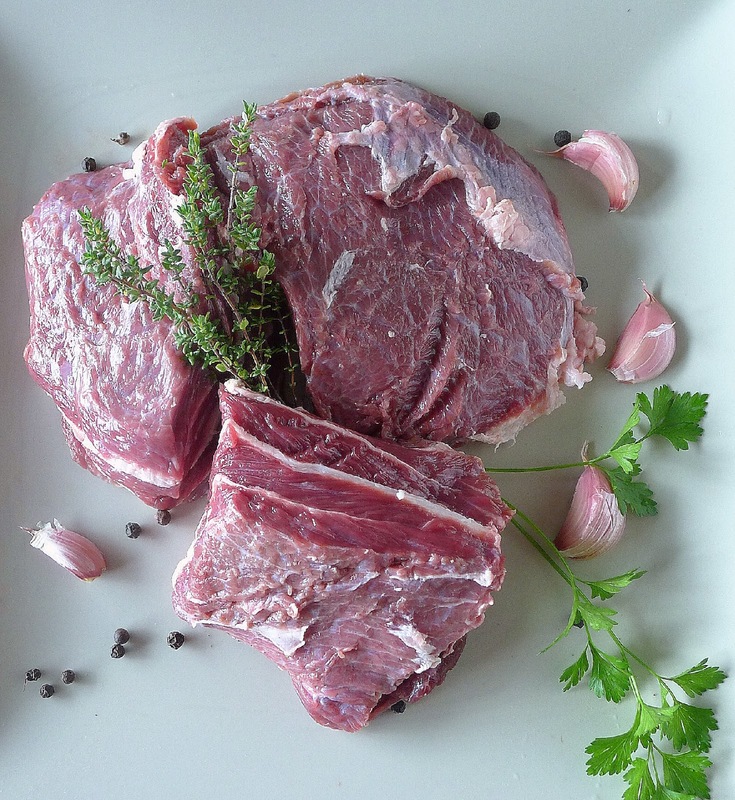 Soak the meat in a bowl of cold water to which the vinegar has been added for 10 minutes. Rinse and pat dry. In a heavy skillet, heat 1 tablespoon of the oil. Brown the beef cheeks on all sides. Add the unpeeled garlic cloves and peppercorns to the skillet. 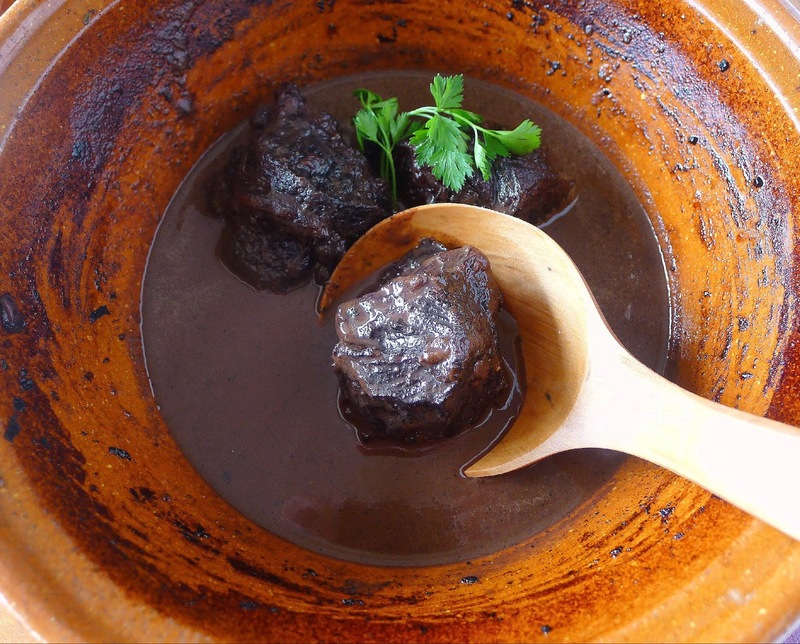 When meat is browned, transfer all to a lidded cazuela or Dutch oven that can go into the oven. Add the remaining 1 tablespoon of oil to the skillet. Add the onion and carrot and sauté them, stirring frequently, until they begin to brown, 5 minutes. Add 2 tablespoons of the wine to the skillet and continue browning the onions. Add the sugar to the skillet with 2 tablespoons more of the wine. Cook until sugar begins to caramelize and turn dark brown. Stir frequently and modulate the heat so sugar doesn’t burn. Add all the remaining wine. Bring to a boil and remove from heat. Carefully pour the wine and onions over the beef cheeks in the cazuela. Liquid should almost cover the meat. Add thyme, parsley, bay and salt. Meat is browned, ready for the oven. Place the lid on the cazuela and place in the oven. After 10 minutes, lower the oven temperature to 350ºF. Braise the meat for 60 minutes. 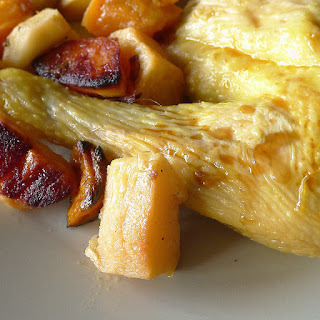 Remove the cazuela from oven and turn the pieces of meat. Cover and return to the oven. Braise until meat is fork-tender, about 60 minutes more. 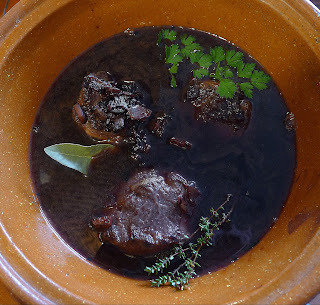 Remove meat with a little of the liquid from the cazuela. Discard sprigs of herbs and bay. Remove garlic skins and return the cloves of garlic to the liquid in the cazuela. When liquid has cooled slightly, place it in a blender and puree. Sieve the sauce. Pour over the braised meat. Reheat to serve or refrigerate, covered, overnight. When meat is tender, sauce is pureed and sieved. 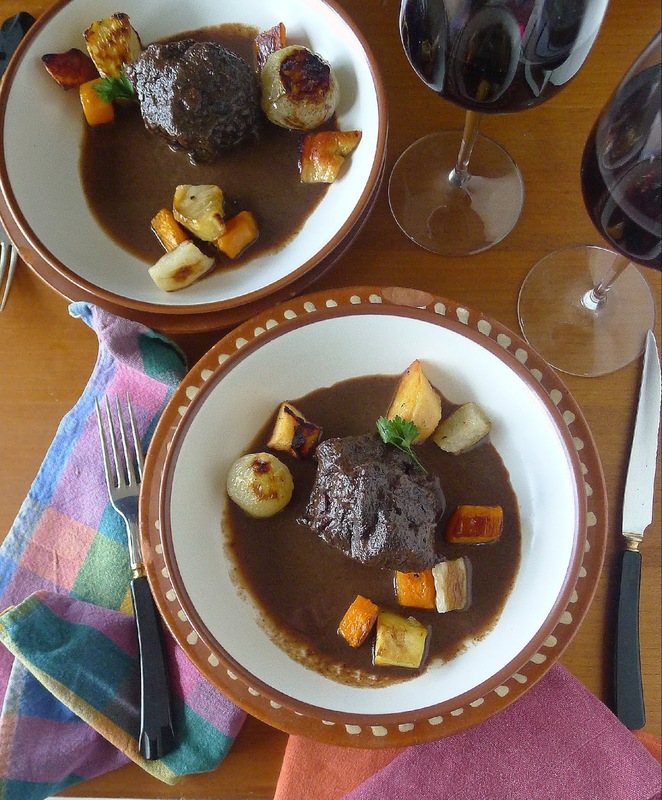 Pork Cheeks with Wine and Prunes. Pork Cheeks in Tomato Sauce. I used to regularly lunch at a beachside restaurant on the Costa with friends, editors at the magazine where I free-lanced. Our favorite meal, after starting with plates of tiny wedge-shell clams, grilled shrimp and fried calamares, para picar, was a whole fish baked in a salt crust. The waiter would display the oversized roasting pan with the fish buried under its mound of salt before proceeding, tableside, to crack the crust and serve the moist fish onto our dinner plates. 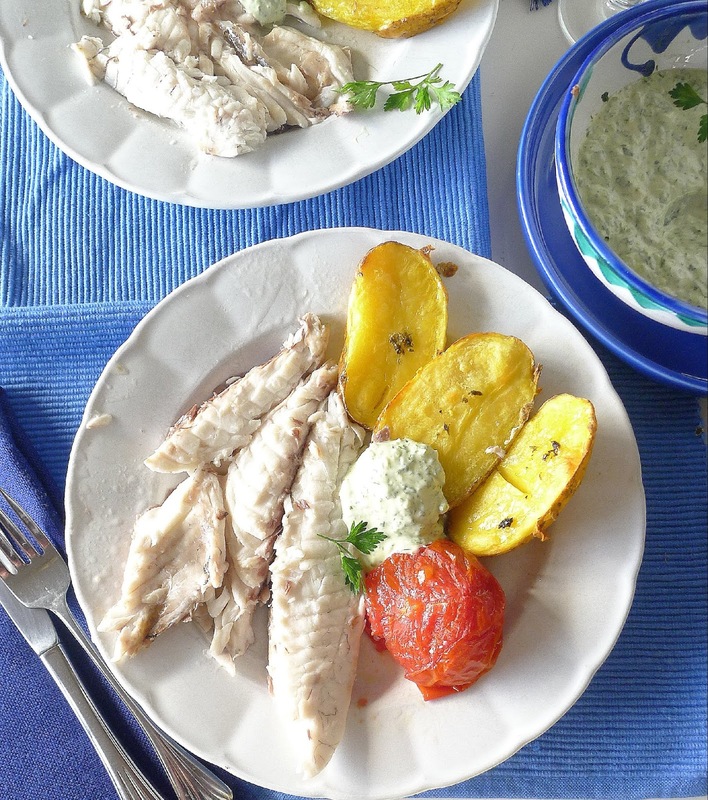 Accompanied by steamed potatoes and a simple alioli garlic mayonnaise, the fish was pure heaven. A whole gilt-head bream baked in salt. The fish, usually dorada, gilt-head bream, or lubina, sea bass, was a big one, weighing 3 or 4 pounds whole (restaurants charged by weight), enough to serve four of us. Nowadays, wild-caught fish of that size would cost an arm and a leg and then some. 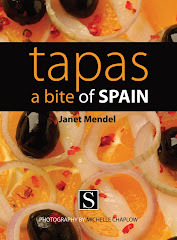 However, markets now sell high quality farmed fish, usually individually-sized, de ración. Acuicultura (aquaculture) and de estero (from the “estuary”) are the terms seen on the labels. 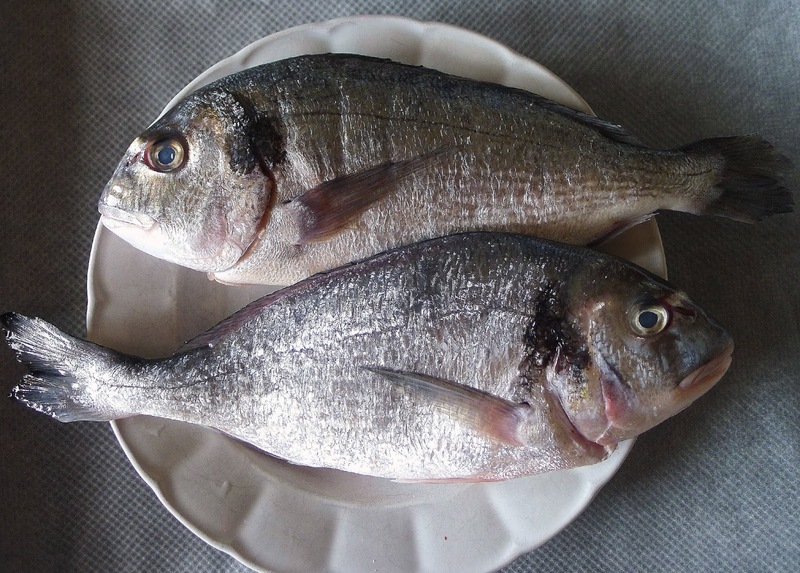 Spain is the fourth largest producer of farmed gilt-head bream on the Mediterranean, after Turkey, Greece and Egypt. 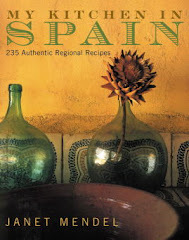 Valencia, Murcia, Canary Islands and Andalusia are the regions with the greatest production. 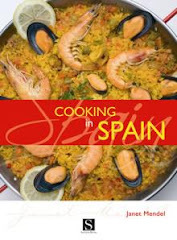 More about aquaculture in Spain here. 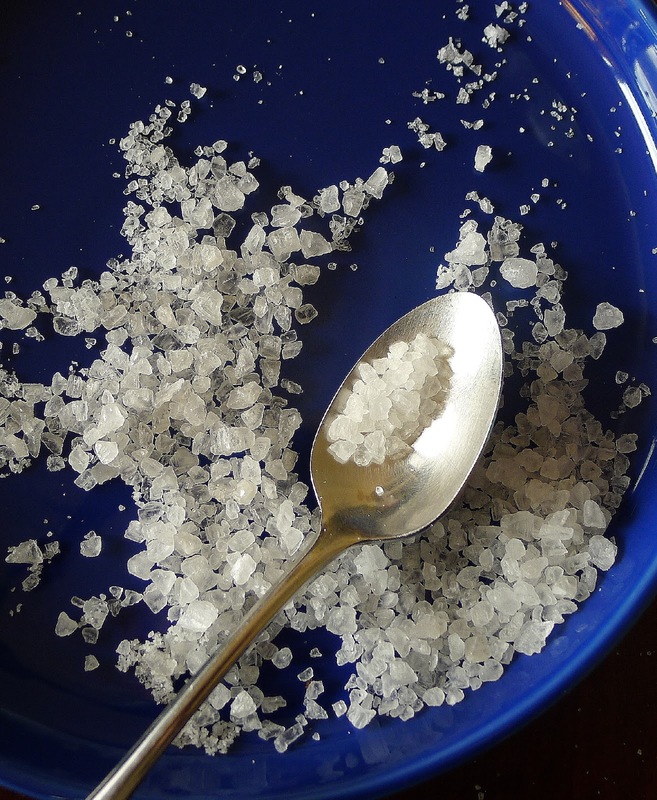 Spain also produces sea salt, both artisanal and industrial. 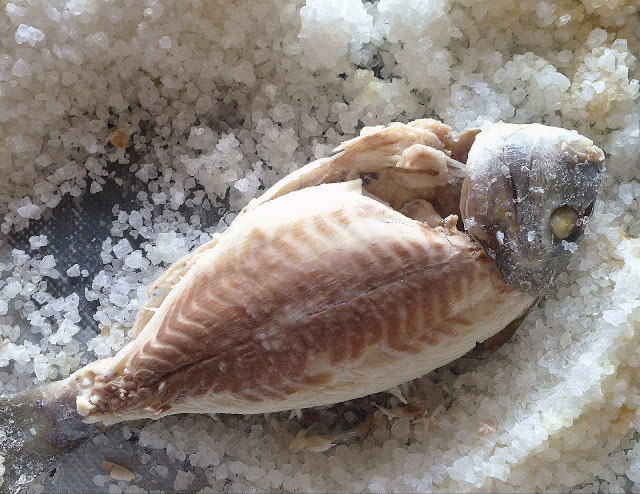 Fish baked in salt originates in the salt flats of Murcia, Alicante and Andalusia. Whole fish weigh just under 1 pound, about right for one serving. 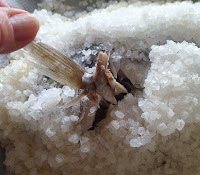 Finding dorada at a great price, I decided to try baking small ones in salt. 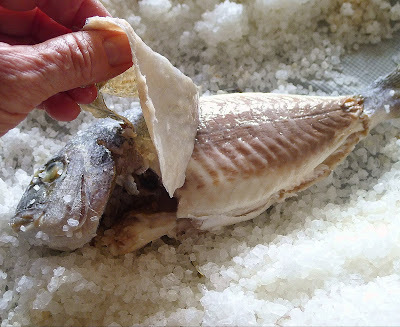 The supermarket fish person knew just how to prepare the fish, removing the guts through the gills, so there was no open cavity for salt to get inside, and leaving on the scales, which also keep the flesh from absorbing salt. 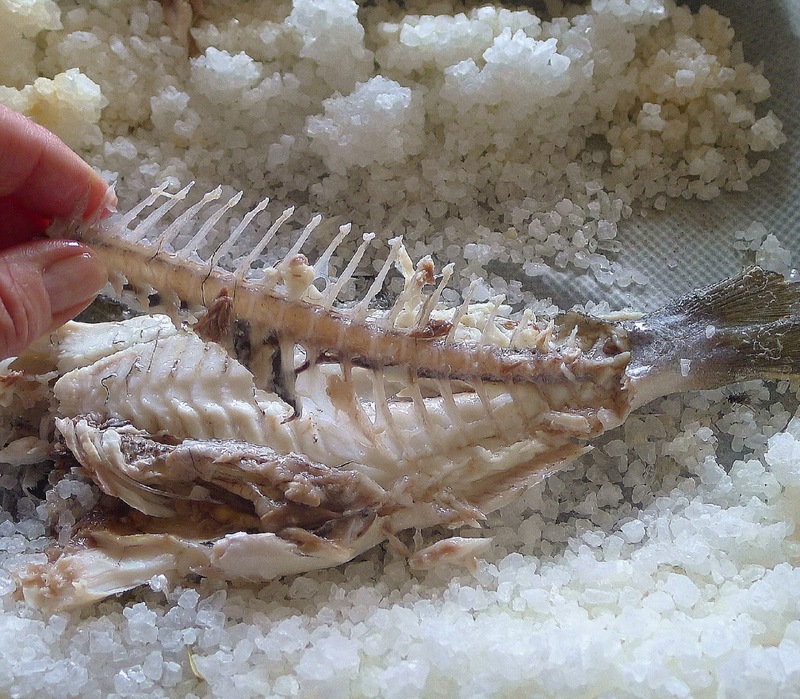 What the salt does is keep all the juices inside the fish and absorb any excess fat that seeps out during baking. In my kitchen, cooking was absolutely simple—mound salt over the fish and bake. Serving was simple, too. The salt crust cracks and is easily scooped away and removing skin and bones from cooked fish is pretty simple. While the fish was baking, I par-boiled some potatoes, sliced them and put them under the grill when the fish came out along with a few small tomatoes. 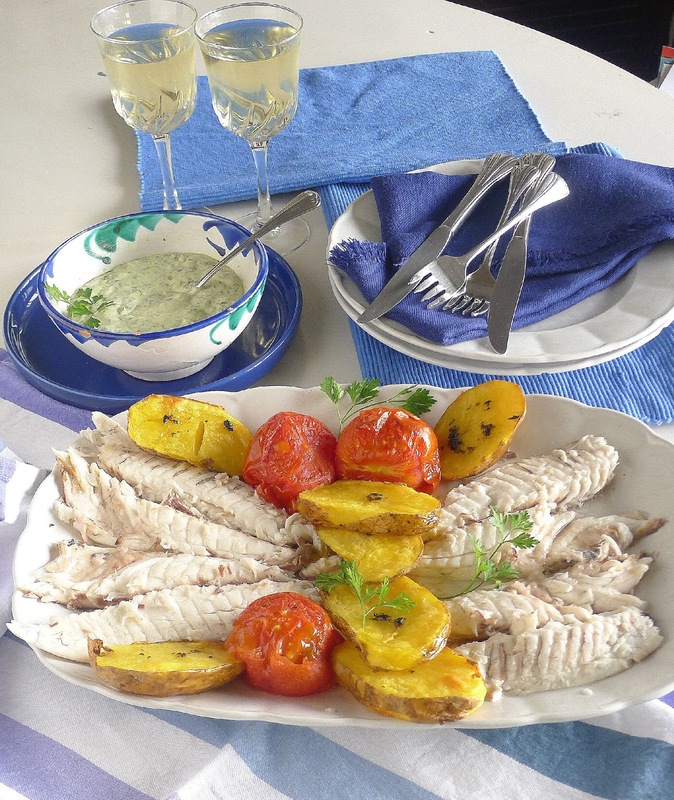 Fish dinner for two--filleted gilthead, grilled potatoes and tomatoes, green mayonnaise. 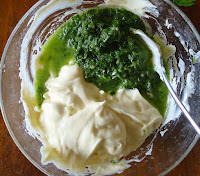 Instead of the typical alioli or salsa verde (green sauce with parsley), I combined the two, making green mayonnaise. Some people like the fish with nothing more complicated than a drizzle of good olive oil. The cooking method does not make salty fish, so be sure to serve table salt! 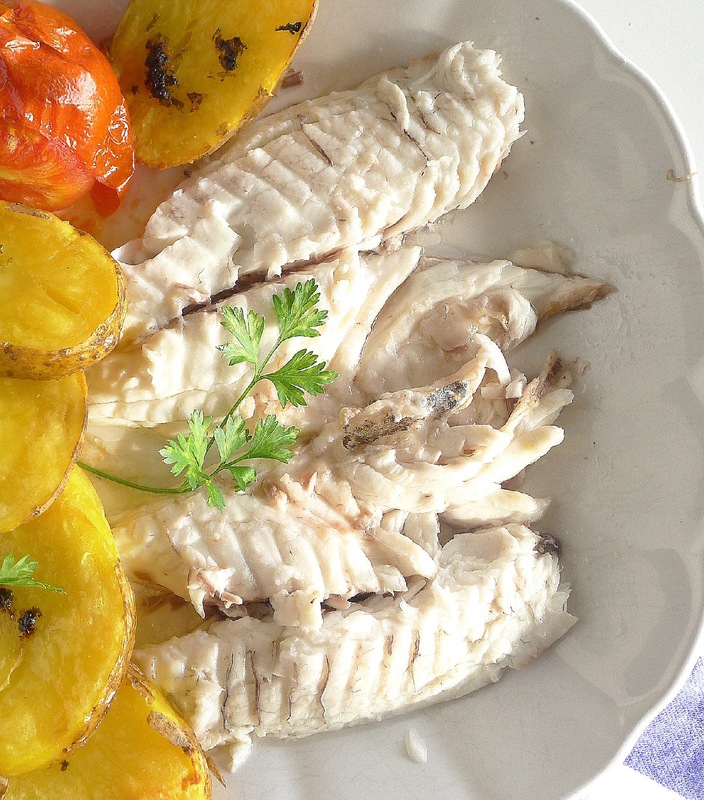 Two (15-ounce) fish make two generous servings. (I saved a couple fillets to make fish tacos the next day.) Here the fish is served with a dollop of garlicky green mayonnaise plus grilled potatoes and tomatoes. I used really coarse, rock salt, to encase the fish. I chose it because the package specifically said it was for use in horno (oven) and plancha (grill). I think a slightly less coarse grind would be better, making a more compact crust. The salt needs just a little moisture to bind it. Adding an egg white to the water compacts it even more. The layer of salt on the bottom of the pan is mostly to keep the fish from sticking to the pan. Lining the pan with foil or baking parchment makes it easy afterward to gather up all the salt for disposal. 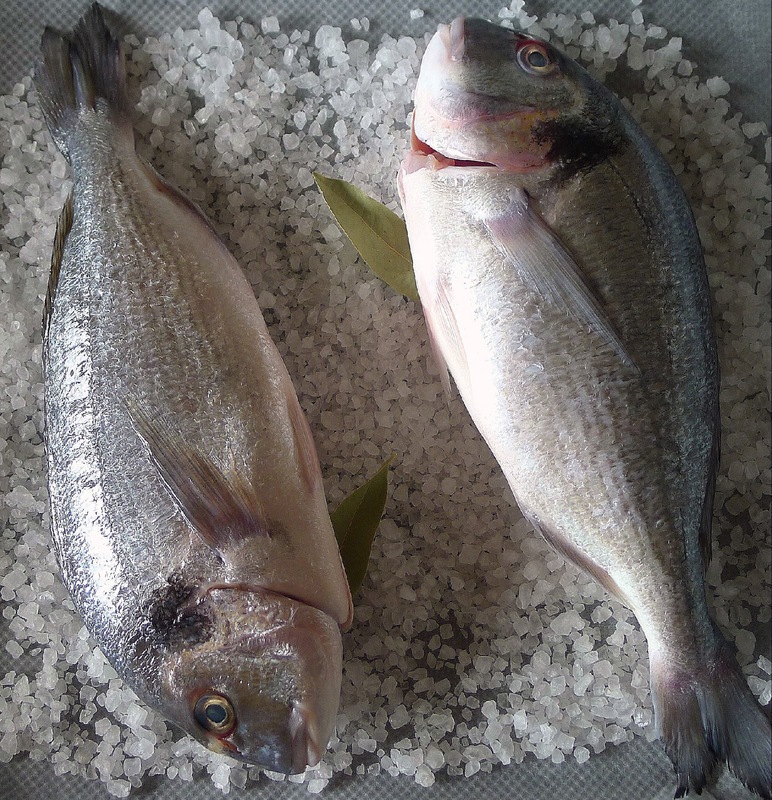 Other fish that are suitable for baking in salt are other types of bream, such as besugo or pargo; sea bass; grey mullet; snapper, or grouper. Notice the fish have been gutted through the gills, so there is no slit in the belly. If possible, have the fish gutted through the gills, without slitting it open along the belly. If this is not possible, make the smallest possible incision to pull out the innards. Don’t remove scales or fins. If you like a herbal flavor, tuck bay leaves or sprigs of fresh herbs beneath the fish. I found bay really permeated the fish. Nice, but next time I will leave the fish in its pristine state. Use fish eye to tell doneness. How long to bake the fish? Fish weighing between 14 and 16 ounces each will need 25 minutes in a preheated 400ºF oven. Add 1 or 2 minutes for every ounce over 16 ounces. 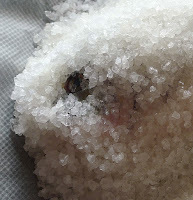 If you excavate a peep-hole in the salt to expose one of the fish’s eyes, you can check to see if the eye has turned milky-white, indicating the flesh is cooked. Fish is done when fin pulls free. Another trick is to leave a fin on one fish sticking up out of the salt. If the fin easily pulls away, the fish is cooked. Use a table knife to crack the salt around the edges of the fish. Let the fish set a few minutes before removing the crusted salt. 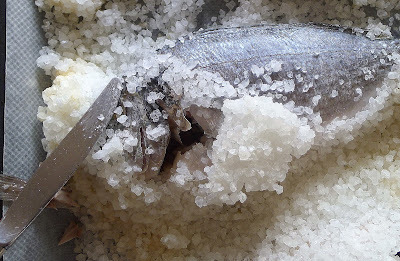 Use a heavy table knife to break the salt all around the edges of the fish, as if tracing its outline. Use the knife and a spatula to lift cracked salt from the fish. You can use a spatula to remove the whole fish from the bed of salt to a serving platter or proceed to remove the fillets. It's easy to pull off the skin while fish is hot. To remove the fillets, cut through the fish at the tail. Lift the skin and carefully pull it away from the flesh. Discard skin. Pull away fins on the sides. Cut off and discard head. Either use a large spoon to lift flesh off the bone or carefully lift the fillet off with a spatula or fish slice onto a heated platter or individual dinner plates. After removing top fillet, lift out the center spine. Lift the spine off. Serve the bottom fillet in the same manner, lifting it away from the remaining skin and salt. Serves 2, 3 or 4. If the fish have been gutted, they need no further prepping. Do not remove head, scales or fins. Rinse in cold water and pat dry. Line an oven tray or sheet pan with foil or baking parchment. 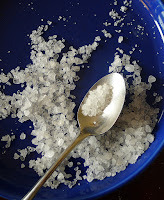 Spread a thin layer of salt on it (about 1 ½ cups). Place remaining salt in a bowl. Whisk together egg white and water. Stir the liquid into the salt to evenly moisten it. Place bay leaves or herbs, if using, on the layer of salt in the oven pan. Place the fish on top, allowing at least 5 inches between them. Mound the moistened salt over the fish. Press the salt firmly around each fish, enclosing them completely. Poke a hole in the salt to expose the eye of one fish (to check for doneness). Bake fish for 25 minutes. Check to see if eye has turned opaque white. Remove the pan from the oven and allow to rest 3 minutes. Crack salt crust and remove it. Serve fish on heated plates. 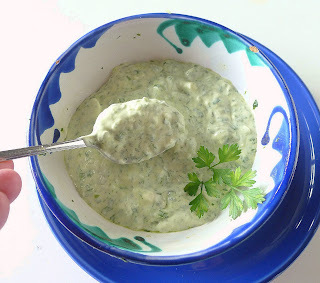 Green sauce mixed with garlic mayonnaise. Spanish salsa verde (green sauce) is primarily parsley. But you can add another fresh herb in addition to parsley. Try mint, cilantro, basil, chives, tarragon or oregano. Use a mini-processor to chop the parsley, garlic and scallion or finely chop them by hand. Add mayo to parsley sauce. Finely chop the parsley, herb, garlic and scallion. Mix in the lemon juice, oil and salt. 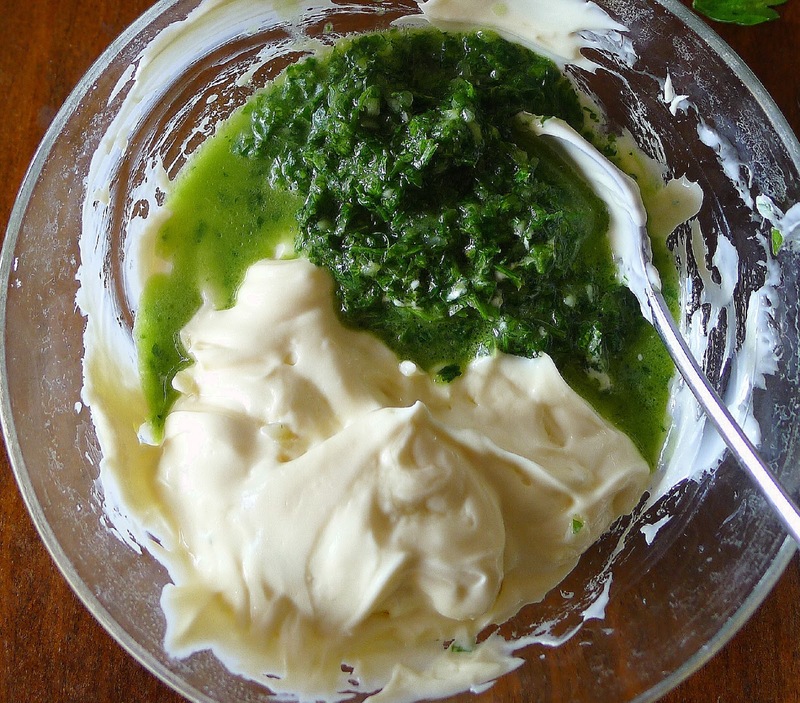 Stir the mayonnaise until smooth and whisk it into the parsley sauce. Red Chile Sauce (Mojo Picón). ¿Llevas el táper al trabajo? was the headline of a story in my local newspaper. It took me a minute—and a glance at the accompanying photo—to figure out what the article was talking about. 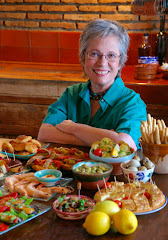 The photo showed a pretty chica with a stack of covered plastic containers filled with food. The article was not asking if you take your tapir to work, but “do you take your lunch to work?" Those covered plastic containers are "tápers." “Táper” is Spanish phonetic spelling for “tupper,” as in Tupperware®. It's the generic name for all plastic storage containers with lids. While it’s been years since I´ve carried my lunch to work or packed school lunchboxes, I do pack a lunch when I’m travelling. That way I can avoid carb-heavy airport and in-flight meals. I've quite enjoyed meals eaten out of a "tupper" while waiting for boarding. A spinach timbale for a working lunch. My favorite packed lunch is usually some variation on a vegetable timbale. Timbale is sort of like a quiche without a crust or a tortilla/frittata that is baked instead of cooked in a skillet. 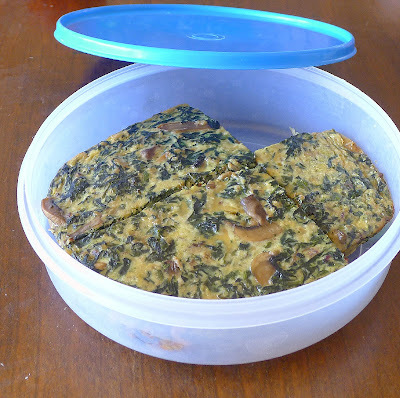 Cut into small squares, it can be eaten with the fingers (be sure to pack some paper towels!) or, with plastic spoon or fork, directly from the container. Timbale with spinach, mushrooms, cheese and eggs is baked, then sliced. 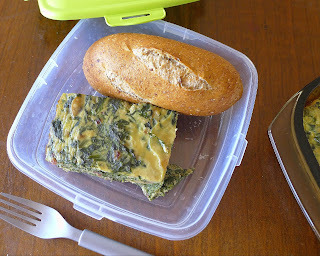 Packed to go--timbale with bread roll makes a complete lunch. An insulated cold-bag is useful for keeping packed foods safe in transit. However, the timbale keeps a few hours at room temperature and needs no reheating. If you’ve got access to a microwave, warm it slightly. Timbale is also good plated as a starter, perhaps with a dollop of Greek yogurt, or as a side dish with a main of grilled fish or chicken. 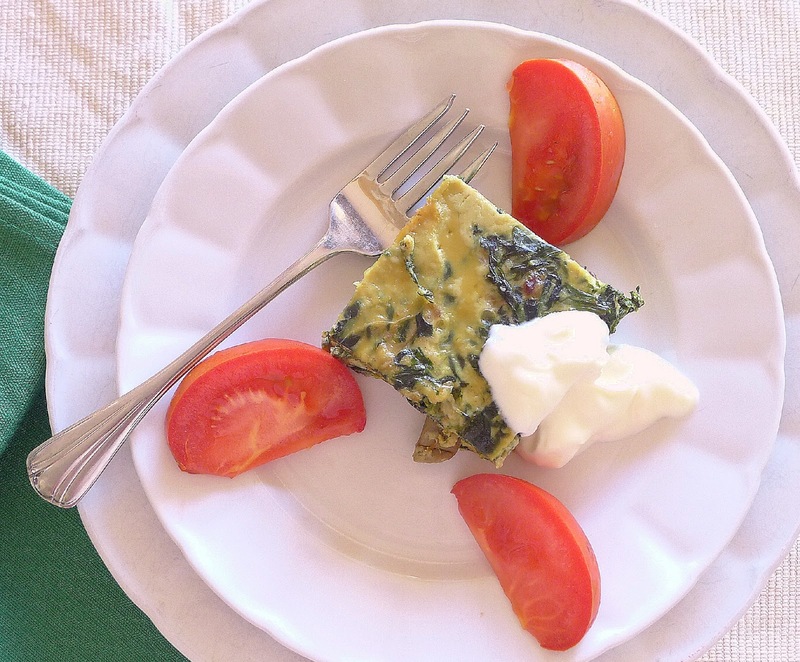 I used two (10-ounce) bags of fresh spinach leaves for this recipe, making about 10 cups of lightly packed, chopped spinach. If substituting frozen spinach, use about 15 ounces frozen spinach (from two 10-ounce packages). Thaw before adding to the skillet with onions and mushrooms. I baked the timbale in a rectangular glass oven dish. Alternatively, it can be baked in a round deep-dish pie pan, a cake pan or a loaf pan, although the baking times will vary. If you’re carbohydrate shy, make this without the bread crumbs. If you want a vegetarian version, omit the diced ham. Add pine nuts or chopped walnuts instead. Substitute dill for parsley for a Turkish inflection. 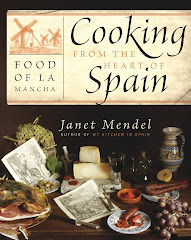 Use a semi-cured (sheeps’ milk) Manchego or any other grated cheese. 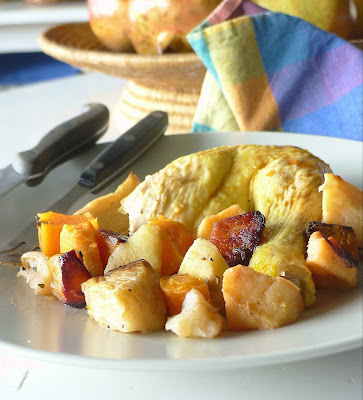 The Sephardic version of the timbale, called cuajado de espinacas, uses cottage cheese plus Romano. 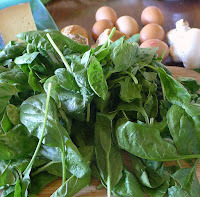 Heap of fresh spinach reduces in cooking. Use 1 tablespoon of the oil to generously grease a rectangular baking dish (11 ½ X 8 inches). Heat the rest in a deep pan. Sauté the onions and garlic until softened, 3 minutes. Add the mushrooms and ham and sauté 4 minutes. Add the chopped spinach. 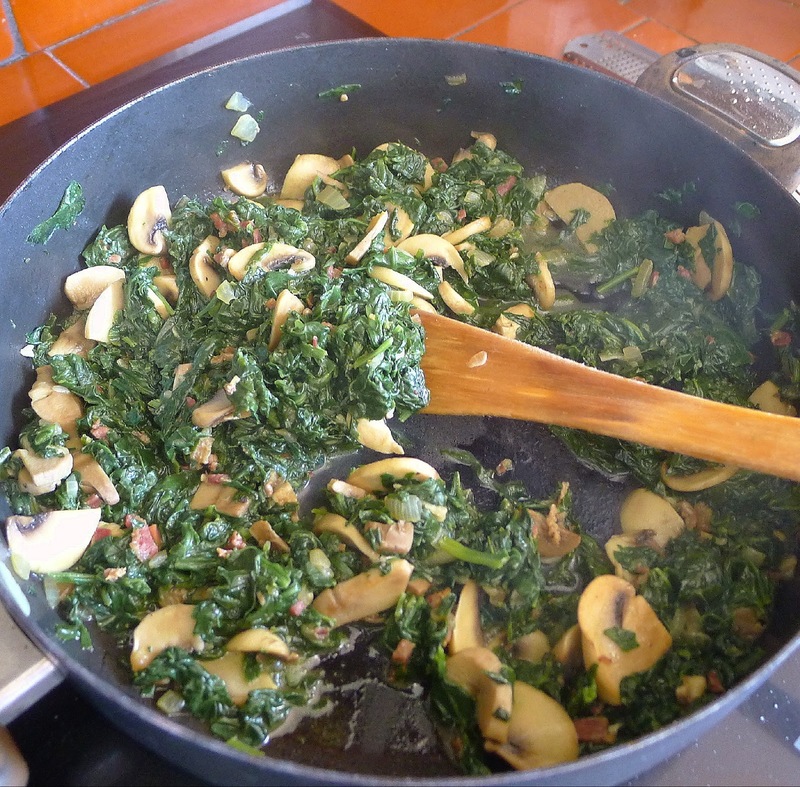 Cover the pan and cook until spinach begins to wilt and reduce in volume. Season with salt, pepper, cloves and nutmeg. Uncover the pan and cook until most of liquid has cooked away. Cool the spinach 15 minutes. Stir in the parsley. While spinach is cooling, place the breadcrumbs in a mixing bowl and add the milk. Let the bread soften 5 minutes. Mash it with a fork. Beat in the eggs. Stir in the grated cheese. 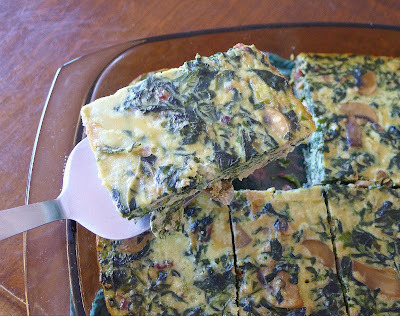 Combine the spinach and the egg-cheese mixture. Pour into baking dish. Cover with foil. Bake until a skewer inserted in the center of the timbale comes out clean, about 45 minutes. Remove foil and bake the timbale 5-10 minutes longer until lightly browned on top. Serve the timbale warm or room temperature. After timbale cools, store it, covered and refrigerated. This shallow container in Spain is known as a "tortilla keeper," as it's the perfect size for storing a potato tortilla. My jumbled collection of plastic storage containers and lids-- not Tupperware®. 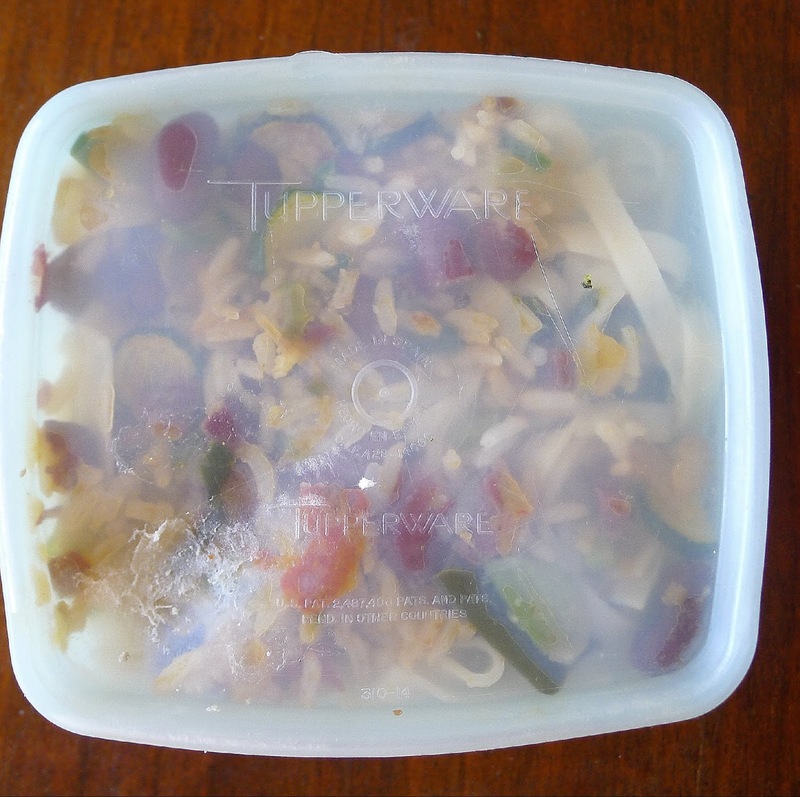 An authentic Tupperware container from 1976, still in use. I acquired it at a Tupperware party given by a neighbor in rural Spain. In those days, village women still carried a hot meal placed in three-tiered aluminum pans to their menfolk working in the fields. 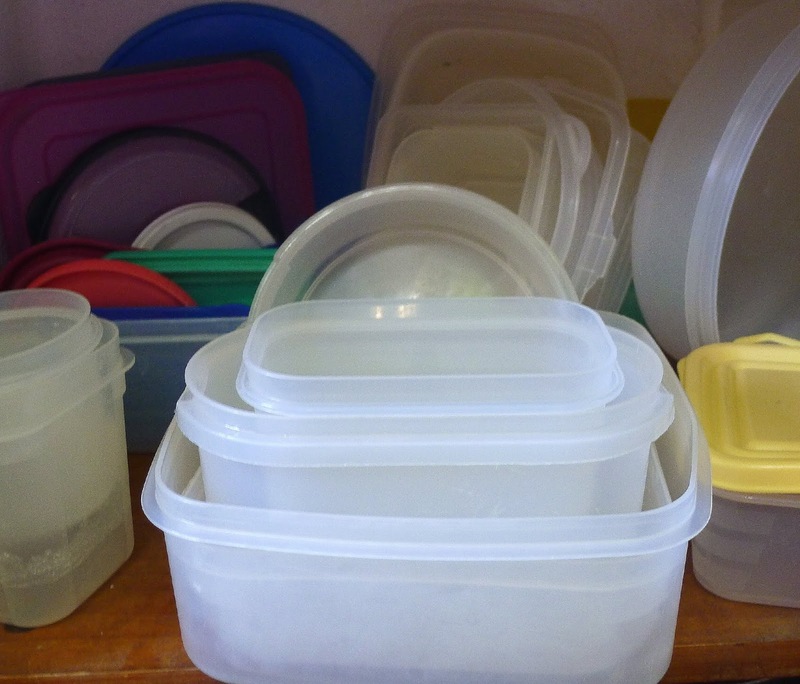 Plastic had only begun to appear in local kitchens. 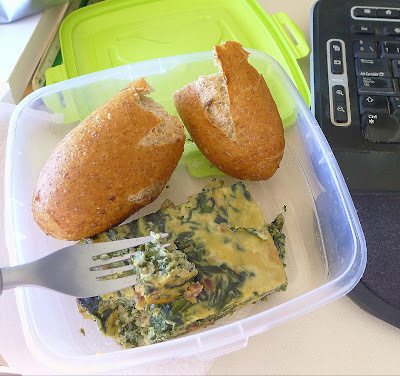 The newspaper article about packing a lunch in the "táper" suggests options such as salads of pasta, rice or quinoa, with or without meat or fish; all kinds of vegetable dishes; cold or warm cream soups, and lentils. (“Who says that lentils are only to be eaten hot?”) Here are links to recipes that might work nicely for the lunchbox. Shrimp and Fideo Noodle Salad. Tuna and Roasted Pepper Sandwich.